EOS 760D, 750D, 700D, 70D, 650D, 600D, 60D. 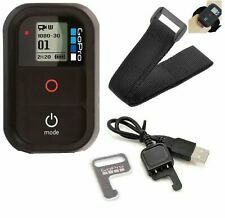 EOS 1500D, 1300D, 1200D, 1100D, 1000D. The bulb shooting mode allows you to take long exposure pictures i.e. start trail. Powershot G16, G15, G12, G11, G10, G1X, G1 X MK2, G3X, G5X. Supplied with the tube drum and 6m (20 foot) long tube. Can be reduced in length by disconnecting a section of tube and reconnecting the bulb. Approx length: 36cm / 15". 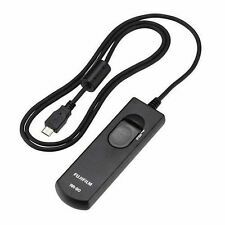 Well, now you can say good bye to spoiled pictures with this shutter release cord. Shutter cable only with printed info how to use it. For steady shots as: Macro, night shots. NIKON 1, J1, J2, V1, V2, V3, AW1, 8400, 8800. Guardate le altre mie inserzioni. - N75, N65. - F75, F65, F55. - Pronea S. - D3000, D3200, D3300. GoPro 2, GoPro 2018, GoPro Fusion, GoPro Hero 7 White, GoPro Hero 7 Silver. You can even strap it to your wrist for portability. GoPro Session. Color: Black. 1 x Wrist Strap. 1 x Charging Cable. Not compatible with. Note: this adapter doesn't fit Sony and Minolta flash. A flasher standard socket is seated at the top part with a fixed nut on the bottom surface. EOS 5D 7D 60D EOS 600D, EOS 550D, EOS 500D, EOS 450D, EOS 400D, EOS 350D, EOS 300D, EOS 30/33/30V, EOS 50/55, EOS kissIII, EOS kissIIIL, EOS 100, EOS 10, EOS 300V, EOS 300X, 300VQD, EOS IX, IXUS jr/II/III, SURESHOT, ELAN7, Rebel T1 Date, Rebel T2 Date, Z180u, Z155, 120, 370Z, G6, G5, G3, G2, G1, S70, S60, SIIS, Pro 1, Pro 90 IS, EOS 5D Mark II/EOS 7D/EOS 550D/EOS 500D/EOS 450D/60D/600D D5000 D3000 D90 D80, D70S, D70, D60, D50, D40, D40X, 8400, 8800, Pronea S.
It can be used for self-portraits or reduce blur when using slower shutter speeds. 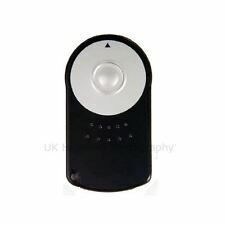 1 x Infrared wireless remote for Sony. Release mode: Focus, Shoot. Infrared can't be seen by human eyes. 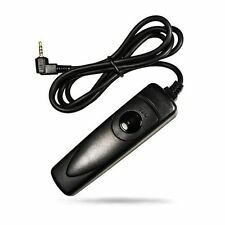 1 x FREE remote battery. 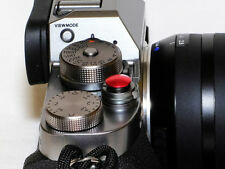 Consider this the Bentley of shutter release buttons! Each unit is exquisite made, and supplied with plastic display box. Pour boîtiers reflex argentiques dotés d'une prise mécanique pour déclencheur souple. Gaine de renfort anti-pliage. Câble souple de 40cm. Grâce à un contrat spécifique ils sont protégés (RFID) et suivis durant tout le trajet. CANON 300D 400D 450D 500D 550D 600D 650D 700D 5D 6D 7D 10D 20D 30D 60D 70D 5DII 5DIII 100D EOS M. canon Rebel T -Rebel T1i -Rebel T -Rebel T2 -Rebel T3 -Rebel T -Rebel T4 -Rebel T5 -Rebel XS -Rebel SL EOS M.
D5000, D5100, D5200, D5300, D5500, D5600. D600, D610 D750, D7000, D7100, D7200, D7500, D90, Df. D3100, D3200, D3300. The bulb shooting mode allows you to take long exposure pictures i.e. start trail. This is anEtsumi 360° Free Arm Joint made in Japan. It can swivel in a complete circle. It appears to be like new. The generic cable release is 9” long, but I can provide any length you might need. The staunch support of the community makes the success of the Hilton Head Humane Association possible.GMG. HILTON HEAD HUMANE ASSOCIATION'S. (The Hero2 you will need a WiFi bacpac). Shutter button. Power/mode/select button. D850, D800, D800 E, D810, D810A, D500, D700. The wireless release supports high speed continuous shooting which is a plus if you need to shoot sports or fast moving objects. Supports single shooting, continuous shooting, bulb shooting and 4 seconds delay shooting mode. EOS 6D, 6D mk II, 7D, 7D mk II. EOS 5D, 5Ds, 5Dsr, 5D mk II, 5D mk III, 5D mk IV. EOS 10D, 1D, 1D mk II, 1D mk II N, 1D mk III, 1D mk IV. EOS 1D X, 1Ds, 1Ds mk II, 1Ds mk III, 1Ds mk IV, 1Dx mk II. The wireless release supports high speed continuous shooting which is a plus if you need to shoot sports or fast moving objects. D750, D7000, D7100, D7200, D7500, D90, D3300, Df. Product model: YP-860II DC2. Coolpix P7800, Coolpix A, D3100, D3200, D5000, D5100, D5200, D5300, D5500, D5600, D600, D610. The wireless release supports high speed continuous shooting which is a plus if you need to shoot sports or fast moving objects. Auch kompatibel mit: FDR-X3000, HDR-AS300V, HDR-AS100V, HDR-AS50, HDR-AS30V, HDR-AS20, HDR-AS15. A7, A7 II, A7 III, A7R, A7R II, A7R III, A7S, A7S II, A7S III. A6500, A6300, A6000, A5100, A5000, A3000. A9, A99 II, A58, A68, RX10, RX10 II, RX10 III, RX10 IV. HX300, HX350, HX400HX50, HX60, HX80, HX90, HX90V, NEX 3N. The most extra ordinary feature is what we call "Scenario" mode which combines any of the available trigger options to create magic. Its refined user interface is easy to use and readily adjustable to fit your needs. Ft 2, FZ100, FZ15, FZ150, FZ20, FZ200, FZ30, FZ50, FZ300, FZ330, FZ1000, FZ2000, FZ2500. G1, G10, G2, G3, G5, GF1, GH1, GH2, GH3, GH4, GH4A, GH5, G6, GX1, L1, L10, LC1, TS2. Product model: RW-221/RS1 (L1). Ft 2, FZ100, FZ15, FZ150, FZ20, FZ200, FZ30, FZ50, FZ300, FZ1000, FZ2000, FZ2500. G1, G10, G2, G3, G5, GF1, GH1, GH2, GH3, GH4, GH4A, GH5, GX1, G7, GX7, L1, L10, LC1, TS2, G6. Connecting cable for Panasonic RS1 type x 1. D850, D800, D800 E, D810, D810A, D500, D700. Product model: RW-221/DC0. RW-221/DC0 is compatible with. RW-221 uses the FSK system and the world wide free 2.4GHz frequency (FSK modulation is used to improve the reliability and stability of the product). 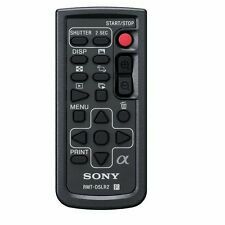 Original Sony BLT-UHM1 für Sony Action-Cam HDR-AS10, HDR-AS15, HDR-AS20, HDR-AS30V, HDR-AS50R, HDR-AS200V, HDR-AS100V, HDR-AZ1VR, FDR-X1000V! Original Sony ActionCam-Produkt. 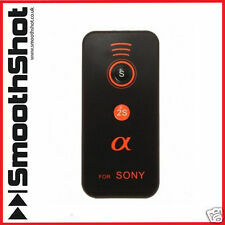 Genuine Sony ActionCam-product. EOS 6D, 6D mk II, 7D, 7D mk II. EOS 10D, 1D, 1D mk II, 1D mk II N, 1D mk III, 1D mk IV. EOS 5D, 5Ds, 5Dsr, 5D mk II, 5D mk III, 5D mk IV. EOS 1D X, 1Ds, 1Ds mk II, 1Ds mk III, 1Ds mk IV, 1Dx mk II. Product model: U-880/N3. Supplied with the tube drum and 6m (20 foot) long tube. Includes release extension with rotating tip 15cm (5.9") long. Can be reduced in length by disconnecting a section of tube and reconnecting the bulb. Product model: TW-283/E3. Canon E3 Type Shooting number can be set from 1 to 99. Shutter Connecting Cable for Canon E3 type X 1. 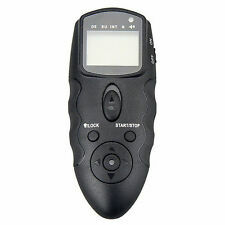 The transmitter and receiver adopts LCD screen which is more easy and simple to handle. Phottix TR-90 features Phottix TR-90 specification Phottix TR-90 C8 compatibility Canon: 10D, 20D, 30D, 40D, 50D, 5D, 5D Mark II, 5D Mark III, 1D, 1Ds, 1D Mark II, 1D Mark II N, 1Ds Mark II, 1D Mark III, 1Ds Mark III, 1D IV. The MC-30A has a 10-pin plug and works with any Nikon with a 10-pin remote port including the following Nikon DSLRs: D3, D3s, D3x, D4, D200, D300, D300s, D700, D800, and D800E.D810. Trigger Lock for Unlimited Exposure. D600, D610 D750, D7000, D7100, D7200, D7500, D90, Df. D5000, D5100, D5200, D5300, D5500, D5600. Product model: U-880/DC2. The Shutterboss Version II has been updated with two new features, the Power Off option which gives the ability to power the device off to conserve battery life and the Reset option which allows the Shutterboss to be reset to the default settings, so that each setting does not need to be reset individually. D3, D300, D300S, D3, D3s, D3X, D4, D4s, D5. D850, D800, D800 E, D810, D810A, D500, D700. You can also select from 1 to 99 continuous shots or set the device to take an unlimited number of photos. The backlight can be locked to remain on when shooting in low light conditions.